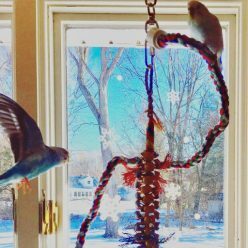 I’ve always been an advocate for keeping budgies in the center of your home where they can be a full participant in your daily lives. 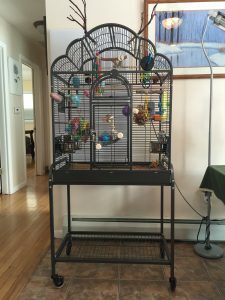 So, it may seem odd that I’m going to try giving the budgies their own room now after years of advising otherwise! 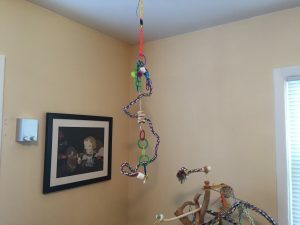 I do have some good reasons, first, here’s what’s wrong with our current set up. 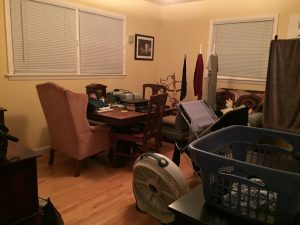 My house is relatively small and only one floor. 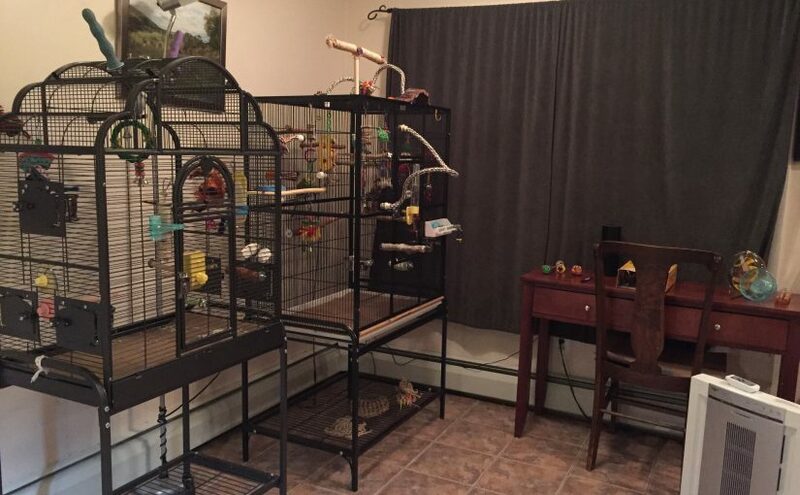 We have just under 1,000 square feet, which is perfectly fine for two adult humans. 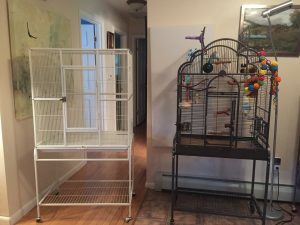 With the small size and open floor plan, the budgies’ cage set up is currently in spitting distance of both the kitchen and living room. 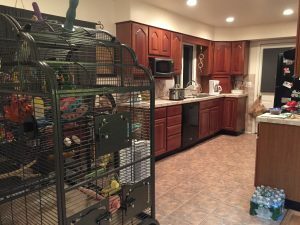 It’s okay for them to be this close to the kitchen, which is typically not advisable, because we use all bird-safe cookware, and frankly don’t cook that much or elaborately anyhow! 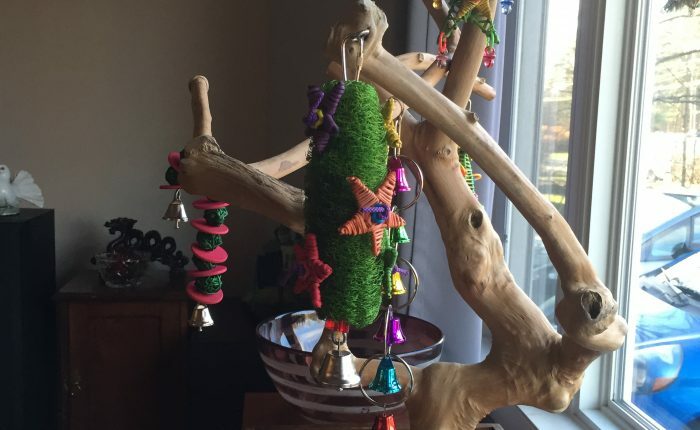 Although their health is fine, it’s become sort of a pain over the years for we humans, and we’d like to be able to turn on the kitchen light after 7:30pm on occasion! Also, it’s tiresome sneaking around your kitchen if you want a glass of water in the middle of the night. 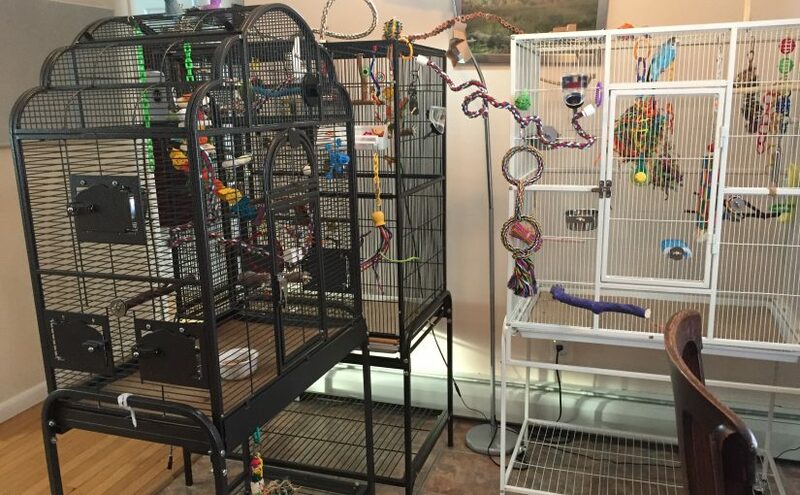 In addition to our human gripes with the set up, I think the parakeets would be better off in a quiet, darker and less trafficked area for sleeping. 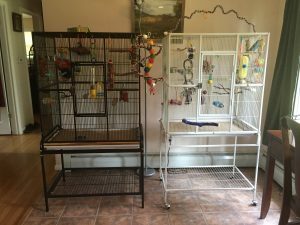 It might also help us shake Toby and Kelly out of breeding condition if they could truly get 12 hours of darkness, which I am increasingly sure they aren’t getting with their current living arrangement. Also, it will get them further away from doors that open to the outside world, and that’s always a good thing! 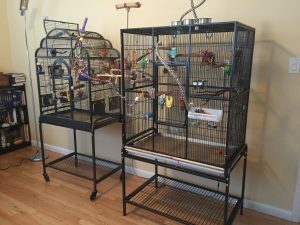 I can fully bird-proof their new room, and won’t have to worry about anyone landing in a kitchen sink, or under the reclining couch. Another factor is Toby’s continuing obsession with Patrick. Her desire to scream in his ears and preen his eyeballs can be hard for Patrick to deal with (understandably). 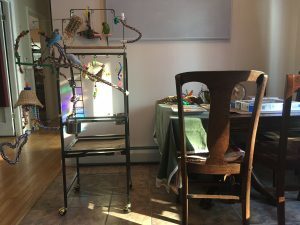 The unhappy result is the parakeets sometimes spend more time in their cages on the weekends than I would like, so that Patrick can live his life without being harassed constantly. 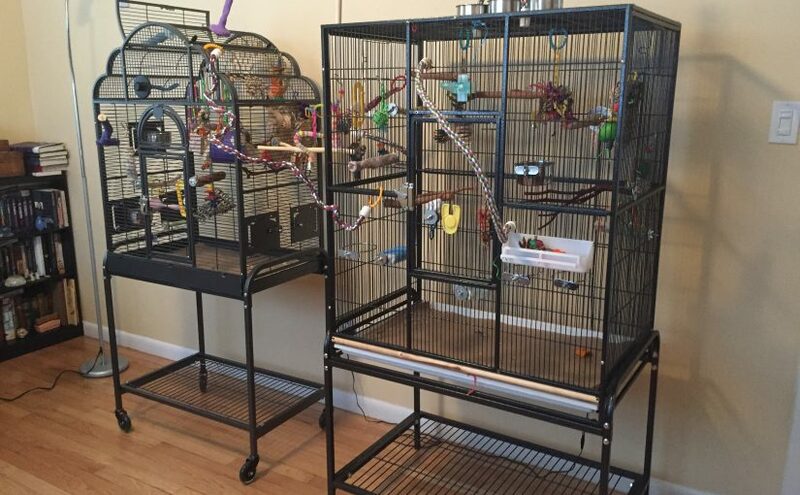 If they can be out with me in a separate bird-friendly space it would be a huge help. This is the room that will be theirs. It’s actually the master bedroom in the house so lucky them! Currently it’s my home office space and laundry line/drying rack. 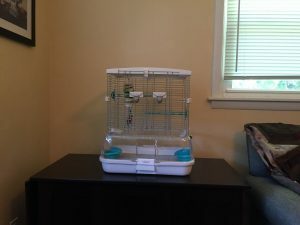 To prep this room we are removing the dining table and other pieces of furniture, and then we will add some window perches a new light fixture and a dimmer switch so I can keep up with their nighttime routine. 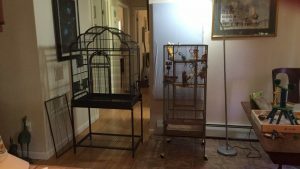 They will still be welcome in the rest of the house and I will keep their play gym in the space their cages used to be. I don’t anticipate losing any time with them after the switch. 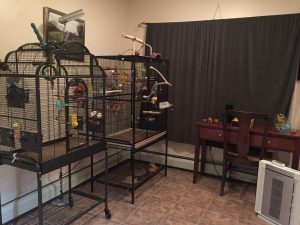 I work full time outside the home, but the proposed bird-room is where I work on the blog, and a comfortable space for humans to hang out. I could definitely see myself chilling in there with them after work every day and on the weekends. 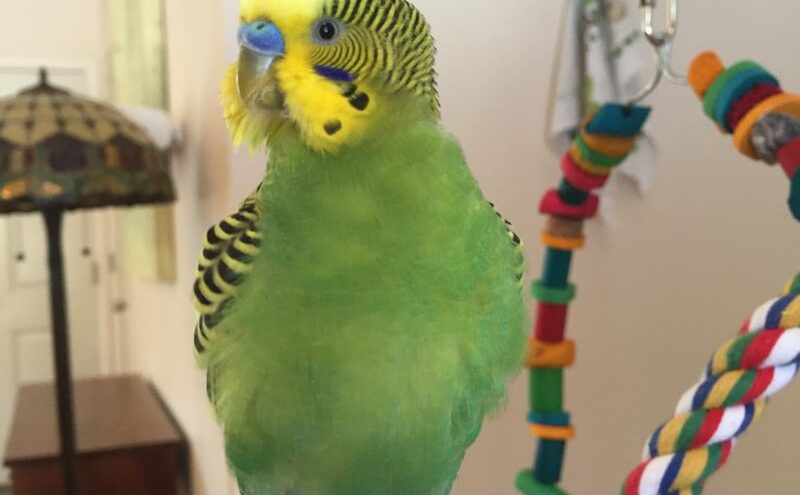 Another bonus is that it will help contain the parakeet feathers and allergens, which have increased exponentially with the addition of Kevin. If it doesn’t work out we can very easily reverse the change, but I think it’s worth a shot! I’ll post an update after we make the switch. 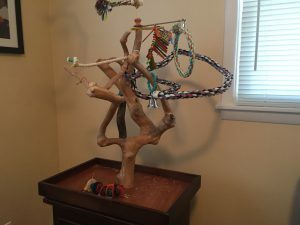 I wanted to also thank everyone who helped me by commenting on my Facebook post when I was trying to decide what to do. There was pretty much a 50/50 split on whether it was a good idea, but I found that everyone’s input helped a lot!